Select Language Ukrainian English United Arab Emirat Bulgaria Czech Danish German Greek Spanish Finland French Croatian Hungarian Italian Hebrew Japanese Korean Lithuanian Latvian Netherlands Norwegian Polish Portuguese Romanian Slovak Serbian Breakfast Thai Turkish Humidistat: Hair type humidistat What makes hair hygroscopic? Humidistats sense of moisture or humidity of the air flowing through them. In order to sense changes in humidity, humidistats often use materials that expand when they absorb moisture from the air. They are known as "hygroscopic materials". Human hair and nylon are two examples of common hygroscopic materials. Wood and membranes. Electronic humidistats use different materials. As we did for thermostats and pressurestats, consider an example in which the sensor element sends electrical signals to control the devices that it controls. This electric control. Version with pneumatic and electronic sensing elements are also available. The model shown here uses human hair sense humidity of the air around him. As humidity increases, hair wet and expanding. This gives two vertical levers turn right, closing the contacts. Decrease of humidity causes the hair is dry and contract, breach of electrical control circuits. 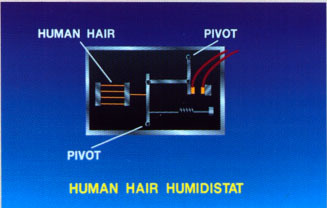 When arranged so that the managed device cycles with humidity growth and cycles off humidity reduction. Human hair humidistats very susceptible to problems caused by dust and dirt accumulation. While they are accurate, periodic maintenance is necessary to ensure reliable performance. One use of humidistats is the cycle compressor on and off. Humidistats are used in applications where the amount of moisture in the air is critical to the process are carried out in air-conditioned comfort. Computer rooms, photographic, textile plants, microelectronic Assembly areas, and some storage space among applications, such control may be necessary. Comfort air conditioning applications rarely use humidistat as the primary control for compression equipment. Here humidistat that uses nylon tape element. Nylon tied light metal that wound in the form of springs. Nylon is expanding with increasing humidity, coiling coil tighter and tilt closed contacts on the left. This completes the electrical circuit of control and turns the system to dehumidify the air.